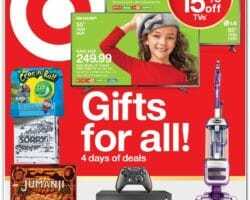 Browse Target Weekly Ad & Flyer Sales. 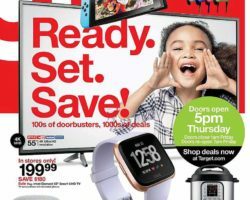 Don’t miss this week Target Ad, electronics deals, digital coupons, weekly circular prices, and current specials for apparel, furniture, footwear, toys, appliances, groceries, and more. Target is a department store that carries women’s, men’s and kids’ fashion, baby items, homewares, toys, décor, appliances, furnishings and a lot more at great prices every day. They sell UCLA gear plus school uniforms, family graphic tees, adaptive clothing and have discounts in all departments at all times. Part of the everyday selection are also kitchen and dining sale items, patio and outdoor with deeper discounts at end of season, and accessories for the entire family. Target stores are known for being convenient and well inventoried on a daily basis. Many people stock up here during big sale events when they can save the biggest bucks on everything storewide. Target, however, provides weekly deals and runs promotions regularly with discounting up to 25% on home items, having clearance sale with extra money off, and dropping prices on select items. Customers with a Target REDcard save an extra 5% every time they shop and receive early access to special promotions.